A Vision being pursued by CIG during its next five years of funding. Examples of computations and data available to help us understand solid earth dynamics at a range of scales. In this case, the dynamics of plate boundary processes and their interaction with global mantle flow. 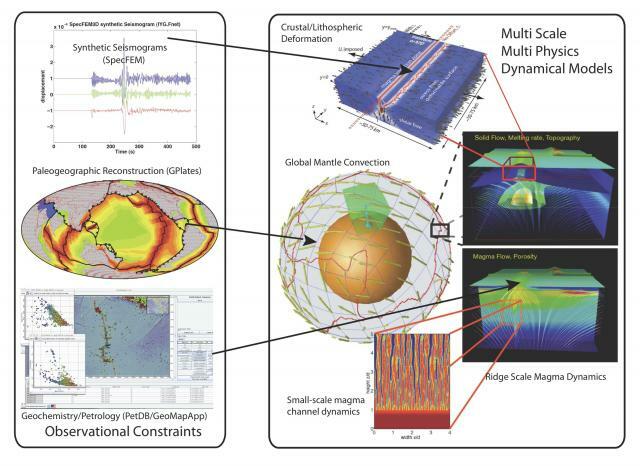 RIGHT PANEL: Example output of computational codes for global mantle convection (CitcomS), midocean ridge flow with melting and melt transport, crustal scale magma injection and faulting (Gale), and small scale reactive melt channel formation. Each model was designed to consider a particular scale or set of processes. The challenge is how to permit users to combine these models, as needed, to explore the dynamics of the coupled interactions and use them to make inferences from geophysical and geochemical data. LEFT PANEL: Example data used to test and drive models, including seismic waveforms (SPECFEM), plate reconstructions (GPlates), and geochemistry (PetDB).